You make great friends. Whether it be through SCBWI, Kahani, my critique group (Karen L. Day and J. L. Bell both have a web presence), or at Kindling Words, the encouragement and support I get from other writers is unique, I'm convinced, to the realm of children's literature. We rejoice with those who rejoice and mourn with those who mourn. In the early 20th century, three women illustrators: Jessie Willcox Smith, Elizabeth Shippen Green, and Violet Oakley lived and flourished together in a shared space above the Red Rose Inn. As their careers blossomed, they were called "The Red Rose Girls." At a time where society and the illustration profession was male dominated, the Red Rose Girls painted their own path and succeeded -- an example which we dare to follow. 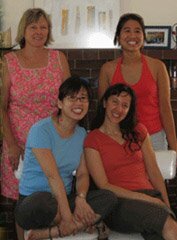 In 1996, three women illustrators: Grace Lin, Anna Alter and Linda Wingerter forged a bond via the internet. Relying on each other, the seeds of their children's book careers began to take root; and they named themselves "The Blue Rose Girls," as an homage to the friendship of Red Rose Girls before them. As their work bloomed, they sent out runners and authors Libby Koponen, Meghan McCarthy and editor Alvina Ling, soon found themselves planted. You go, girls. I'm going to love eavesdropping on your chat.